Almost all the people who've been to Bali must know about Tanah Lot. A temple built on a large rock in the middle of the sea, with great sea waves around the temple. Admirable and fascinating. Pura Tanah Lot was enchanting, a place of worship also become a tourist attraction visited by many people from different countries. Even Pura Tanah Lot Bali became an icon for tourism in Bali. Because of the beauty, uniqueness and sanctity of the temple is very difficult to be matched by similar attractions elsewhere. The beauty of a large rock in the middle of the sea, with large plants are thriving, and a Balinese temple, and views of the vast ocean without end, large ocean waves around the stone, with the sun during the afternoon. Famous sights are always becoming an attraction for tourists visiting Bali, an enchanting place to relax, enjoy the beauty of an amazing place, a place to enjoy the evening atmosphere with a sunset that will not be forgotten. 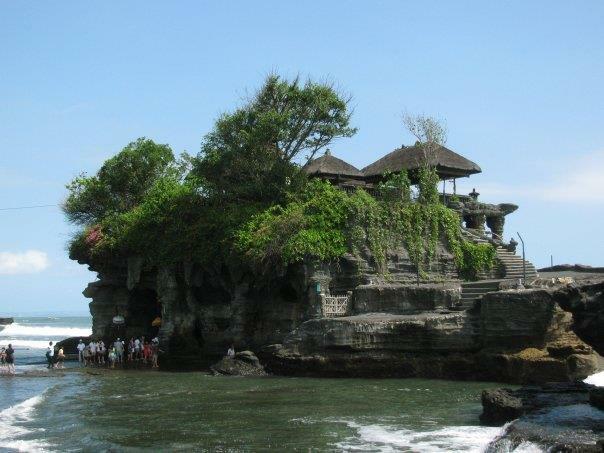 Around Tanah Lot Bali also has available many lodging options and restaurants. So anyone who wants to spend a day in this place, it would not be difficult to get all the facilities and needs to cool. Cheap hotels are very much in Tanah Lot Bali. Cheap accommodation in Bali is not a difficult thing to in the can. Accommodation is most easily obtained in Tanah Lot, Tabanan, Bali. Because the accommodation business has become part of life in Bali tourism, wherever you are in Bali, very easy to find a cheap hotel. Also at Tanah Lot, is very easy to obtain cheap hotel near Tanah Lot Bali.